“There is no place of worship like Sabarimala where man (devotee) turns into God and vice versa. Here, everyone is considered a representative of God or even God himself,’’ said noted playback singer S.P. Balasubrahmanyam. 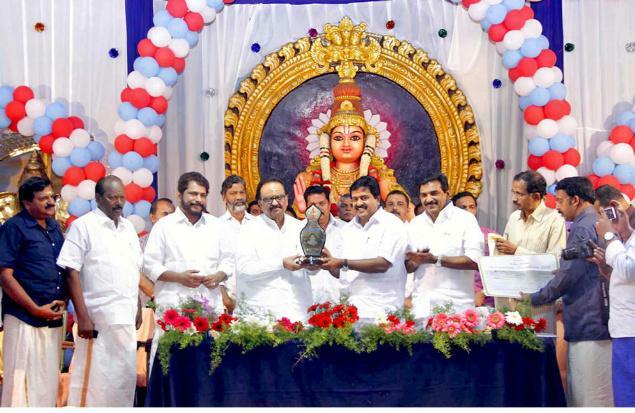 Mr. Balasubrahmanyam was addressing a function at the Sabarimala Sannidhanam on Saturday after receiving the Harivarasanam Award instituted by the State government. Minister for Health and Devaswom V.S. Sivakumar presented the award to the singer. He said the Sabarimala Ayyappa Temple was a universal place of worship where religion, caste, creed, poor, or rich did not matter. Mr Balasubrahmanyam said this was his first visit to Sabarimala, though he had sung a good number of Ayyappa devotional songs in different languages over the past five decades. Mr.Balasubrahmanyam, accompanied by Mr Sivakumar, and other officials, offered prayers at the Ayyappa Temple.